When I heard about the No Croutons Required event I knew that I wanted to take part. The February theme was vegetarian soups. The only problem was that I had no idea what kind of soup to make. While I was looking for ideas I had the Food Network on in the background and they were talking about Mexican cuisine. They mentioned that some of the regional staples were corn, beans and squash. Those three ingredients sounded like a perfect start to a tasty soup. I added some more regional flavours such as chilies, tomatoes, tomatillos and cumin. I had also been wanting to try using quinoa in a soup and this was a great chance. Back when the tomatillos were in season I froze a bunch of them and now was the perfect time to pull them out and see how they did. Luckily the tomatillos froze really well and I was about to make some tasty salsa verde to add to the soup. Although the soup is not the most photogenic it turned out to be really tasty. A nice hot and spicy soup for the cold days that we have been having. I thought that the quinoa added a nice texture to the soup. The slightly sweet corn and squash were a nice contrast to the otherwise spicy soup. I garnished the soup with some sour cream with chopped cilantro. You could also garnish the soup with some tortillas chips, grated cheese, avocado, etc. Add the onions and saute until tender, about 3-5 minutes. Add the garlic and the jalapeno peppers and saute until fragrant, about 1 minute. Add the chili and cumin and saute for a minute. Add the squash, stock, tomatoes, salsa verde, quinoa, oregano, bay leaf, salt and pepper. Simmer until the squash is tender, about 20-30 minutes. Turn off the heat and stir in the corn and cilantro. Kevin, you have alot of great flavours at play, quite Aztec with the quinoa. YUM!! I have had a wicked cold and would kill for a bowl of that soup right now! This is a great entry Kevin! I’m a big fan of quinoa and will have to try this one for sure. As you may have noticed, I’m also very much into spice, so I’m especially impressed! Thanks for participating. Hey there! Thanks for leaving the comment. The recipes you make look fantastic. I am adding you to my google reader! This soup looks really delicious…and I like the idea to garnish with avocado! You have a lot of great recipes here! This sounds like a great soup! Yum! this is a fantastic entry Kevin!! 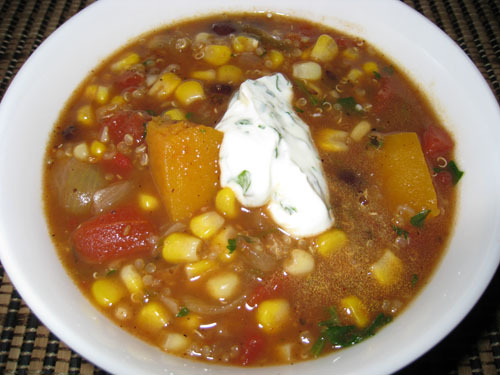 love the combination of this soup: colorful, delicious and healthy :-)and i love the name too!! Delicious!! This would definitely be comforting on a chilly day! That looks fantastic! I love all the ingredients, so tasty and delicious! I love the heartiness of this soup – it’s a whole meal and so colourful. This soup sounds delicious! I’ve never thought of adding quinoa to soup. The salsa verde looks great too, yum. sounds yummy, i could go for some! love the addition of the squash.